The innovative BP-FL75 battery uses Olivine – Lithium Iron Phosphate – instead of conventional Lithium Ion cathodes. The result is a substantial increase in charge-discharge cycles compared to previous Sony batteries. It also takes only 70 minutes to be fully charged with the BC-L90 fast battery charger. The BP-FL75 is same height as the PMW-F55 and PMW-F5 cameras, making the camera and battery package ergonomically streamlined for ease of use. Fully charged, the BP-FL75 provides more than 1-hour operation of the PMW-F55 and PMW-F5 working with the AXS-R5 recorder. The BP-FL75 battery uses Olivine – Lithium Iron Phosphate – instead of conventional Lithium Ion cathodes. 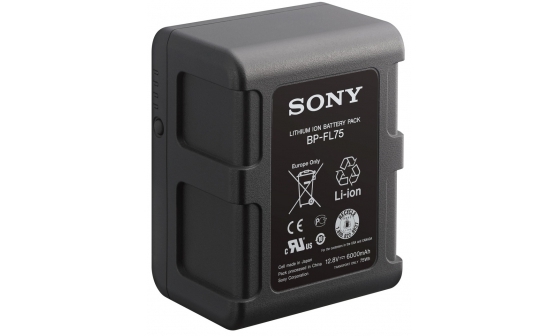 The result is a substantial increase in charge-discharge cycles compared to previous Sony batteries. The BP-FL75 is same height as the PMW-F55 and PMW-F5 cameras, making the camera and battery package ergonomically streamlined for ease of use. Fully charged, the BP-FL75 offers more than 1-hour operation of the PMW-F55 and PMW-F5 working with the AXS-R5 recorder. The Olivine battery works with Sony’s BC-L90 high speed battery charger for the quickest charging times, just 70 minutes to be fully charged to 75Wh capacity. It can also be used with standard battery chargers (such as AC-DN10 or BC-L160) with normal charging times.